It is a few days before Christmas. Someone tells you that you have $200 to spend at Walmart on anything you choose. What would you do? 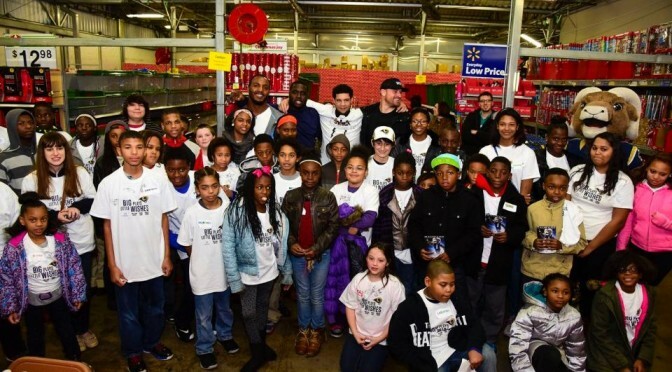 St. Louis Rams defensive ends William Hayes, Chris Long and Robert Quinn gave 45 kids that experience. For the second year in a row, the three players teamed up with Big Brothers Big Sisters to host Big Plays Little Wishes. Before the shopping began, each child and their Big, or mentor, had a great dinner at Twin Oak Wood Fired Fare. Each Little Brother and Sister, as the kids are called, received a t-shirt and had the chance to talk with the players. Of course none of the defensive ends got away from any child without signing an autograph. Once everyone had finished their meal, they all traveled across the street to Walmart to get the shopping started. Many of the “Littles” began shopping with their “Bigs” in the toy section, but soon each basket headed out to other areas in the store. With unselfish hearts this holiday season, many kids did not just shop for themselves…they picked up Christmas gifts for friends and family, as well. Hayes, Long and Quinn had a good time helping the kids find what they wanted in the store, but they especially enjoyed being able to be a kid just like them. After they paid for their items that night and said their farewells to the players, each kid received a gift bag and goodies provided by Walmart. Big Brothers Big Sisters - Eastern Missouri offers a chance to have a friendship with an older individual to kids in the area who may face adversity, or who may just need that male or female figure in their life. Bigs are matched with Littles to encourage, support and create a long lasting relationship. For more information on the program, or how you or your child may get involved, visit www.bbbsemo.org.